Archive for the ‘Gaming’ Category. That's it. 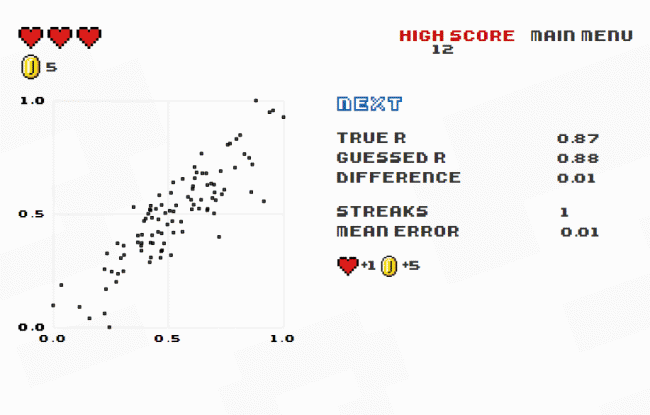 They plot a distribution, you guess the correlation in the form of R. If you are close, you keep going. Too many misses and its game over. Via Flowing Data. Played around with it a bit, high score at 52 now. The new installment in the Civilization computer game series is out. This review dings it a bit for being too like the last installment (Civ 5), but I am sure I will like it because I still evidence addictive behavior whenever I go back to Civ 5. Just one more turn.... After how badly the Sim City franchise has been trashed in recent installments, I will take a Civ game that is safely similar to the old Civ games. Though my life, the Civilization game series is probably second only to having children in terms of sucking up my free time. Cross-word predicting next day's election results.